After I removed the section on the mixing matrices from the Spin Path Integral paper, I sexed them up and sent them to Physical Review Letters. By “sexed them up” I mean that I rewrote it in terms of Lie Groups and Lie Algebras. Their editor responded, in about 48 hours, that the paper was too mathematical and not enough physical for that journal. Matrices” to the number 2 (we try harder) elementary particles journal, Phys. Lett. B. They have the advantage of being free. In addition, they are a “rapid publication” journal. After 6 long weeks of waiting, I got back a very short bad review. Apparently the review was bad enough that the editor told me the paper was rejected. In an email, I pointed out to the editor that the comments by the reviewer were incorrect. I suppose that he agreed; in any case he and asked me to revise the paper, if necessary, and to respond to the reviewer. So the paper has passed, but barely, its first review at PLB. I hadn’t included the old paramaterization in my paper because I thought it would be obvious to any moron that it was a lot simpler than the standard one. When I got back a review stating the opposite I was quite angry. Especially since it took 6 weeks to get here. PLB regularly publishes papers less than 2 weeks after submission. I’ll type up a revision that makes it obvious even that the new parameterization is far far superior to the standard. I’ll also add some stuff to show that the parameterization generalizes to nxn unitary matrices. At last year’s annual Gravity Research Essay Contest, I took an “honorable mention”. They give out money to the top few papers and honorable mentions to about two dozen more. This has been going on for a half century so most of 1000 papers have gotten awards. Last year I was the first amateur to get an honorable mention in at least the last 25 years, so this year I typed up a more aggressive attempt, Zitterbewegung, Acceleration, and Gravity. The basic problem in unifying gravity with the other forces is that gravity is written in a completely different language. My approach to this is to force gravity into a form where it’s compatible with quantum mechanics rather than the other way around. In this I use Feynman’s path integrals as shown in the Spin Path Integrals paper. The usual way of graphically describing path integrals is through Feynman diagrams. Now the standard model defines the masses of the elementary particles as what appears as interactions between the left and right handed chiral particles. The left and right handed states are completely distinct in how they behave, particularly with respect to the weak force. So it’s natural to treat them as distinct particles in their own right. But when you split things up like this, the left and right handed particles have to travel at the speed of light. For example, to convert a spin-up electron to a right handed electron, one accelerates the electron in the +z direction. The close one gets to the speed of light, the more completely is the electron right handed. When one accelerates in the opposite direction, the electron becomes left handed. Now it’s quite bizarre, but the results of these accelerations are beasts of completely different behavior. The right handed electron does not interact weakly at all, while the left handed electron does. Einstein got general relativity by making the assumption that acceleration is equivalent, as far as measurements go, to the action of a gravitational field. So my gravity paper analyzes gravity by looking at how an acceleration effects the interaction between left and right handed electrons. My assumption here is that gravity is due to gravitons that propagate faster than light, but otherwise obey the usual laws of quantum field theory. In the above, a photon enters from the left and interacts with an electron coming up from the bottom. 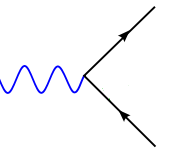 The electron absorbs the photon and its direction of motion is changed accordingly. But in this interaction, the photon is absorbed; thus it is possible to shield the electric force (with a conductor), or the magnetic force (with a superconductor). 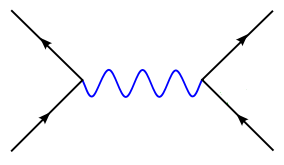 Feynman diagrams are methods of computing matrix elements. You convert these matrix elements into probabilities by multiplying them by spinors. Even if you don’t know the structure of the Feynman diagram for some interaction, you can deduce facts about its Feynman diagram by determining how many spinors must multiply it. In essence, one can count the number of legs going into the Feynman diagram. In the above diagram, only one leg goes into the electromagnetic interaction. Thus, from finding the rates at which the left and right handed electron states convert into one another we derive that they must be composite with three states contributing to each. Of course this is also the subject of the Spin Path Integrals paper. And since the diagram has at least 7 nodes, we obtain that gravity is naturally a force weaker than the others (which cat get by with a single node each). Update 2: The Zitterbewegung paper received no awards at the annual gravity essay contest. I’m considering whether to rewrite it for Foundations of Physics, IJMPD, or one of the other gravity journals. It’s kind of radical. This is exactly the reflexation I asked about. The chirality is the answer? The left side a cube, the right a square? This leads to the assymmetry and the materialization? This leads also to the informational content and the acceleration. Acceleration comes from the impact of binding the energy? But then the space also change, is distorted. And a graviton is emitted, because acceleration is the wave-property (a quantal property), and when the wave is absorbed the matter will change its configuration? This happens in a probabilistic way (a classic property)? Interaction between these gravitons are gravity? Gravity is then strongly dependent on negentropy. In this way all matter is negentropic. I’m just a biologist trying to understand these questions, in purpose to relate them to the birth of a qubit, as an entangled bit of information. Update 3: After improvements, the “Permutation Parameterizations for Unitary Matrices” paper got twice too long for Phys. Lett. B so I withdrew it. I should send it to Foundations of Physics in a few days. It’s now at: newparamfop.pdf , where it’s been renamed “Quantum Information of Unitary Mixing Matrices” which I think is more descriptive. And I’m gearing up to get into (physics) grad school around September 2011. I took the general GRE on July 8th and got 690 Verbal, 800 Quantitative, which should be good enough. I don’t yet have a score on the essay writing portion (was 5.5). And I figure on taking the physics test in October, when it is next offered.